A table with a glass of champagne, a bottle of bubbly on ice and an empty chair were placed on the side of the stage to honor the memory of the British bon vivant. Leach died August 24, 10 months after suffering a stroke while vacationing in Mexico. He was days away from his 77th birthday. He had worked at the Las Vegas Review-Journal since 2016 after more than a decade of covering the celebrity scene for the Las Vegas Sun. 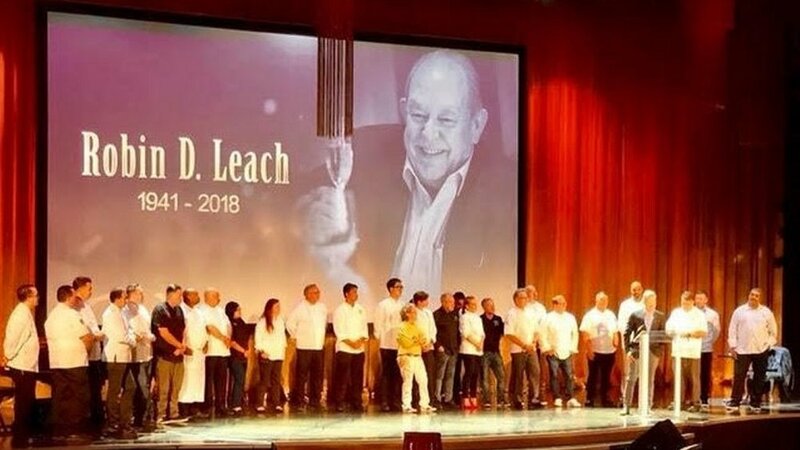 Speakers included Ken Henderson of BEST Agency, who produced the show; Saville Kellner, Tom Kaplan, Eric Klein and Michael Mina were part of a tribute involving 35 chefs on stage. Chefs Wolfgang Puck and Thomas Keller appeared on videos. Other speakers were Robert Earl, Planet Hollywood founder, actresses Suzanne Somers, Morgan Fairchild and Joan Severence and longtime friend Michael Severino. Celine Dion, Brad Garrett, Terry Fator and Gene Simmons sent video tributes. After the program, the audience moved to the Love sign in The Palazzo for a champagne toast and a huge group photo.